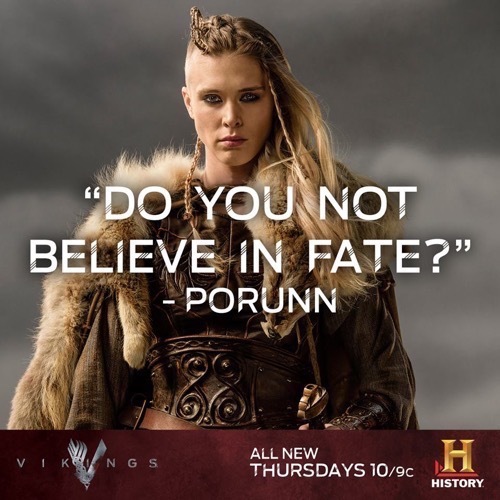 Tonight on the History Channel Vikings returns with an all new Thursday, March 5 season 3 episode 3 called “Warrior’s Fate,” and we have your weekly recap below. On tonight’s episode, King Ecbert visits the developing Viking settlement. On the last episode, a mysterious wanderer arrived in Kattegat; Lagertha and Athelstan establised a Viking settlement. Did you watch last week’s episode? If you missed it, we have a full and detailed recap right here for you. Tonight’s episode looks like it is going to be great and you won’t want to miss it, so be sure to tune in for our live coverage of The History Channel “Vikings” at 10:00 PM EST! While you wait for our recap hit the comments and let us know how excited you are for the season 3 episode 3 of Vikings tonight. Tonight’s episode of Vikings kicks off with Helga bringing back the man she met in the village to Aslaug’s tent – while Aslaug bandages up his bloody hand he reveals that he is a wanderer and he sleeps with the cattle for warmth, his name is Harvard. Harvard says that he tells stories about his travels and the Gods, and he sings for his supper. Aslaug invites him to stay for supper with them, and reveals that Ragnar won’t mind and he is away. King Ecbert is leading his men through the woods, he hears two of his men whispering behind him and turns around and demands to know what they are talking about. They grumble that Ecbert isn’t making Ragnar and his people convert – and why Ecbert is sharing their farming secrets with Ragnar, but not making Ragnar share his boat secrets. Ecbert puts them in their place and challenged them to say he isn’t looking out for the greater good of England – especially while Ragnar is off fighting their battle. Meanwhile, Ragnar, Floki, and the rest of the men are preparing to chase Princess Kwenthirth’s brother and his men up the mountain and away from the boats. Before they leave, Kwenthirth pleads with Ragnar to spare his brother. Ecbert arrives at the land that Lagertha and her people are farming – he has brought some of his nobles to check in on their progress. He gifts Lagertha with a new state-of-the-art plow, he invites her and Agelthstan back to his villa whenever they wish to visit him and then he bid her farewell. His men watch from a distance, they aren’t impressed with the King flirting with Lagertha. Ragnar and his men make it to the top of the mountain, and are able to launch a surprise attack on the army. Ragnar makes it to the Prince, and realizes that there is another entire army protecting him. It looks grim for Ragnar, but Ecbert’s men arrive out of nowhere as back up. Ragnar screams at them not to kill the Prince, like Kwenthirth requested. When it is clear that he is outnumbered the Prince screams that he surrenders and his men drop their swords and bows. Back at the village Harvard is sitting around the fire with Helga, Aslaug, and Siggy. He is telling them a story about when he visited a land full of giants and met with their king. Aslaug and Helga are totally enthralled by their bizarre visitor, but Siggy is not thrilled and it is obvious she doesn’t trust Harvard. He continues his story about being in a wrestling contest with a “horrible old woman.” He jumps up and begins flailing his arms and shouting and getting in to his story. After his story, they realize that he was actually telling the story of Thor. Aslaug’s baby begins screaming and she rushes in the other room to tend to Hivra. Harvard follows him and he rubs the baby’s head and coos that his “pain is all going away.” The baby stops screaming and shuts his eyes instantly and drifts off. Aslaug is shocked and demand to know how he was able to do that. Meanwhile, Lagertha and Athelstan head to King Ecbert’s village to visit him, Lagertha winds up making out with King Ecbert in his bath. Ragnar finds Bjorn on the mountain with his girlfriend – she has been badly beaten and her face is unrecognizable, but she is still alive. Ragnar tries to comfort Bjorn, and he reveals to his father that she is pregnant. Ragnar smacks Bjorn and sneers that he has the “will of a little girl” and he can’t believe that he let his pregnant girlfriend come along to fight in battle. Ecbert visits Lagertha and Athelstan at the farm – they announce that Ragnar was victorious and he and Ecbert’s men defeated the Merciaries. Lagertha and Athelstan invite Ecbert and his men to stay for dinner and a sacrifice – the men protest but Ecbert announces they will be happy to stay. Back at the village a fisherman rows in screaming for help, he dumps his net on the beach and two young boys fall out. He says he found them out in the middle of the sea, they drowned to death. Everyone is baffled as to how they got so far out in the water. Their mother drops to the ground and tries to wake them up. Aslaug, Siggy, and Helga all look at Harvard who is lurking in the background with his hood up. Ecbert and his people stand by and watch Lagertha and the Pagans chant around the fire and sacrifice a cow – they all squeal and cheer when the cow’s head is chopped off and its blood begins gushing on to the ground. They scoop up two bowls of blood and dump them over Lagertha’s head – then they proceed to fill bowls of blood and march out on to the field and begin dumping it all over the crops that they have been planting. Ecbert’s men watch in horror and warn him that the Pagans are trouble – and they need to get them off their land. CDL Giveaway: ‘Vikings’ Season 3 Premiere Epic Prize Pack ($475 Value) – Plus Participate In Vikings Hashtag Raids 2/16/15!